Hong Kong (/ˌhɒŋˈkɒŋ/ ( listen); Chinese: 香港, Hong Kong Cantonese: [hœ́ːŋ.kɔ̌ːŋ] ( listen)), officially the Hong Kong Special Administrative Region of the People's Republic of China and commonly abbreviated as HK, is a special administrative region on the eastern side of the Pearl River estuary in southern China. With over 7.4 million people of various nationalities in a 1,104-square-kilometre (426 sq mi) territory, Hong Kong is the world's fourth most densely populated region. Hong Kong became a colony of the British Empire after Qing Empire ceded Hong Kong Island at the end of the First Opium War in 1842. The colony expanded to the Kowloon Peninsula in 1860 after the Second Opium War, and was further extended when Britain obtained a 99-year lease of the New Territories in 1898. The entire territory was transferred to China in 1997. 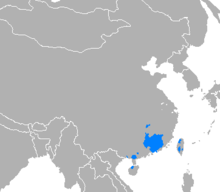 As a special administrative region, Hong Kong's system of government is separate from that of mainland China and its people identify more as Hongkongers rather than Chinese. Cyclists in Hong Kong have the same rights and responsibilities as all other road users, except for prohibitions from expressways and some other designated locations, such as tunnels and many bridges. At least one hand must be kept on the handlebars at all times. Cyclists must use a cycleway wherever one is present. The ecology of Hong Kong is mostly affected by the results of climatic changes. Hong Kong's climate is seasonal due to alternating wind direction between winter and summer. Ngai jong (Chinese: 嗌莊; Jyutping: aai3 zong1) is a cultural phenomenon in universities of Hong Kong. Ngai (嗌) means shout, while jong (莊) refers to the executive committee of a college, department or society under the university's students' union. Hakka hill songs (Chinese: 客家山歌; pinyin: Kèjiā shāngē; Hakka: [hak˥ka˦ san˦ kɔ˦]) are rural songs sung in the Hakka language by the Hakka people. They are probably one of the better known elements that reflect Hakka culture, regarded by many as the 'pearl of Hakka Literature'. Hong Kong has a multi-party system, with numerous parties in which no one party often has a chance of gaining power by controlling the Legislative Council. The Chief Executive is elected by an indirectly elected Election Committee and is nonpartisan as restricted by the Chief Executive Election Ordinance, but has to rely on political parties in the legislature for support, effectively having a coalition government. Land reclamation in Hong Kong: Grey (built), Red (proposed or under development). Note that most of the urban area (shown in pink in the map below) of Hong Kong is on the reclaimed land. Hong Kong Fire Services Department (HKFSD，Chinese: 消防處) of the Hong Kong Government is an emergency service responsible for fire-fighting and rescue on land and sea. It also provides an emergency ambulance service for the sick and the injured, and gives fire protection advice to the public. The People's Liberation Army Hong Kong Garrison is a garrison of the Chinese People's Liberation Army (PLA), responsible for defense duties in the Hong Kong Special Administrative Region since the sovereignty of Hong Kong was transferred to the PRC in 1997. Prior to the handover, Hong Kong was under British rule, and the defense of Hong Kong was the responsibility of the British Forces Overseas Hong Kong, with auxiliary help from the Royal Hong Kong Regiment. Education in Hong Kong is largely modelled on that of the United Kingdom, particularly the English system. It is overseen by the Education Bureau and the Social Welfare Department. In the 2013/14 school year, there are 569 primary schools, 514 secondary day schools and 61 special schools. The Judiciary of the Hong Kong Special Administrative Region is the judicial branch of the Hong Kong Special Administrative Region. Under the Basic Law of Hong Kong, it exercises the judicial power of the Region and is independent of the executive and legislative branches of the Government. The courts in Hong Kong hear and adjudicate all prosecutions and civil disputes, including all public and private law matters. The following is an incomplete list of urban settlements, towns, new towns (satellite towns) in Hong Kong. This is a list government agencies of the Hong Kong Government. Chung Ying Street (Chinese: 中英街) is a street on the border between Hong Kong and Shenzhen, within the border town of Sha Tau Kok (Hong Kong) and Shatoujiao (Shenzhen). One side of the street belongs to Hong Kong and the other belongs to Mainland China. The Hon. Dato Seri Paduka Sir Ti-liang Yang, GBM, (Chinese: 楊鐵樑爵士; born 30 June 1929) is a retired senior Hong Kong judge. He was the Chief Justice of Hong Kong from 1988–1996, the only ethnic Chinese person to hold this office during British colonial rule. Rita Fan Hsu Lai-tai, GBM, GBS, CBE, JP (Chinese: 范徐麗泰; born 20 September 1945) is a senior Hong Kong politician. She is the first President of the Hong Kong SAR Legislative Council from 1998 to 2008 and the member of the Standing Committee of the National People's Congress (NPCSC). Jackson Wang (traditional Chinese: 王嘉爾, Korean: 왕가이; born 28 March 1994) is a Hong Kong rapper, singer and dancer based in South Korea. He is a member of the South Korean boy group Got7 under JYP Entertainment, and is known for his appearances on Korean reality television, notably Roommate. He is also active in China as a solo artist and TV host. George Lam Tse Cheung (born 12 October 1947), also known professionally by his surname Lam, is a Hong Kong-based veteran Cantopop singer, singer-songwriter, music producer and actor. He has remained popular for four decades. Lam produces most of his own albums, writes many of his own songs, occasionally writes for other artists, and covers other people's songs. He is the mastermind of his concerts and many of his LP/CD cover designs. Being very innovative, he came up with the very first Cantopop rap, "Ah Lam's Diary", with lyrics written by himself. In addition, he pioneered the stringing together of many hit Cantopop songs to create a 10-minute long medley called "10 Minutes 12 Inches". Over the years, he has introduced a wide variety of songs to the Hong Kong music scene, with many of his own compositions and covers becoming classics of Cantopop. One of his special talents is in picking which songs to do covers of among a wide variety of sources, including songs from the United Kingdom, United States, Continental Europe, Russia, Middle East, Latin America, Japan, etc. The songs he chose for such covers range from classical music, songs from musicals, Hebrew folk song, to funk and rock and roll. His own compositions and covers encompass a very wide stylistic range, from country rock, rhythm and blues, rock and roll, funk, jazz, rap, Chinese-style tunes to tango and bossa nova. He is particularly skillful in interpreting and performing all songs in his own inimitable style. Lam has a wide vocal range and is known for excelling in many different genres of music. He can sing powerfully in fast rhythmic numbers and in a very heartfelt way in romantic ballads. 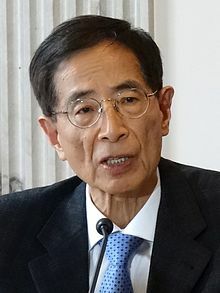 Martin Lee Chu-ming, SC, JP (Chinese: 李柱銘; born 8 June 1938) is a Hong Kong politician and barrister. He is the founding chairman of the United Democrats of Hong Kong and its successor, the Democratic Party, Hong Kong's flagship pro-democracy party. He was also a member of the Legislative Council of Hong Kong from 1985 to 1997 and from 1998 to 2008. Nicknamed the "Father of Democracy" in Hong Kong, he is recognised as one of the most prominent advocates for democracy and human rights in Hong Kong and China. Matt Page is a fictional character from the Australian soap opera Home and Away, played by Alec Snow. The character made his first screen appearance on 21 October 2013. Snow won the role after auditioning in early 2013. Originally contracted for a three-month guest role, producers signed him permanently. Matt's backstory detailed him leading a tough life growing up in the Mangrove River area. He arrives to study at Summer Bay High following the school burning down. Matt is characterised as a troublemaker who lacks self-belief because of his upbringing. No one had ever given him the attention he needed to better his life. He also has a keen interest in music which is explored during his tenure. Initially bullying other characters, writers paired him romantically with Sasha Bezmel (Demi Harman) and provided a home for the character with Leah Patterson-Baker (Ada Nicodemou). Alongside these characters Matt is depicted on a journey trying to turn his life around. 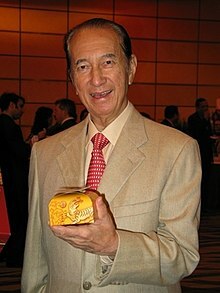 Dato' Sri Stanley Ho Hung-sun GBM GLM GBS GML OBE (Chinese: 何鴻燊, born 25 November 1921) is the founder and Chairman of SJM Holdings, which owns nineteen casinos in Macau including the Grand Lisboa. Ho has been nicknamed variously Godfather and King of Gambling, reflecting the government-granted monopoly he held on the Macau gambling industry for 75 years. His wealth is divided amongst his daughter Pansy Ho ($5.3 billion) who owns MGM Macau, fourth wife Angela Leong ($4.1 billion) who is managing director of SJM Holdings, and son Lawrence Ho ($2.6 billion) who owns City of Dreams. He was the 4th world richest person in world before the handover of HK in 1997. Tan Sri Dr. Runme Shaw, K.St.J (Chinese: 邵仁枚; pinyin: Shào Rénméi; 1 January 1901 – 2 March 1985) was the chairman and founder of the Shaw Organisation of Singapore. Runme Shaw and his brother, Run Run Shaw, together known as the Shaw Brothers, were pioneers in the film and entertainment industry in Singapore and Malaya, and brought to life the movie industry in Asia, especially the Southeast Asian region. ... that in 2012, a small Ru ware bowl from the Song dynasty was sold for HK$207.86 million (US$26.7 million)? ... that during World War II, Huang Qingyun published the only Chinese children's magazine in Hong Kong and China, and corresponded with her readers to help them cope with life in wartime? ... that after journalist Victor Mallet chaired a talk by Chan Ho-tin, leader of the now-banned Hong Kong National Party, he was denied renewal of his Hong Kong work permit? ... that Hong Kong Soya Sauce Chicken Rice and Noodle and Hill Street Tai Hwa Pork Noodle are the first street food stalls in the world to receive Michelin stars? ... that Eunice Lam, called the "prodigal daughter" of Hong Kong, was the sister-in-law of Bruce Lee? Do you have a question about Hong Kong that you can't find the answer to? 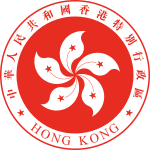 For editor resources and to collaborate with other editors on improving Wikipedia's Hong Kong-related articles, see WikiProject Hong Kong. Victoria Harbour and the Hong Kong skyline at night, taken on December 2007.